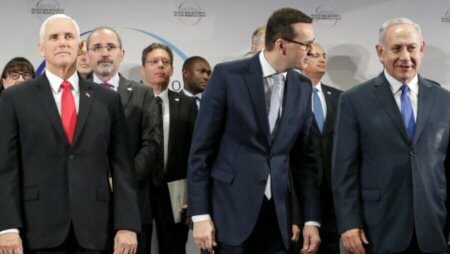 Polish Prime Minister Mateusz Morawiecki said that his country is not sending a delegation to the V4 summit in Jerusalem, following comments by an Israeli foreign minister who said that Poles “collaborated with the Nazis” and “sucked anti-Semitism from their mothers’ milk”. Acting Israeli foreign minister, Israel Katz made the comments on Israeli TV, Sunday, citing something once said by former Prime Minister Yitzhak Shamir, whose father was murdered by Poles. “Poles collaborated with the Nazis, definitely… You can’t sugercoat this history,” Katz said, according to Days of Palestine. Morawiecki called the remarks by Katz “unacceptable” and “racist”. The developments mark a new low in a bitter conflict over how to remember and characterize Polish actions toward Jews during the German occupation of Poland in World War II. Morawiecki had already announced Sunday that he was pulling out of the meeting in Israel on Monday and Tuesday with Israeli Prime Minister Benjamin Netanyahu and leaders of four central European nations. That had followed a comment made earlier by Netanyahu who was quoted as saying that “Poles cooperated with the Germans” in the Holocaust. Foreign Minister Jacek Czaputowicz was to go in his place. However, the whole visit has now been cancelled. The head of the prime minister’s office, Michal Dworczyk described the new statement by the Israeli foreign minister’s department as “disgraceful” in an interview with state radio. The V4 summit in Jerusalem was a planned gathering of leaders from Slovakia, Czech Republic, Poland and Hungary. Katz told Israel’s Army Radio on Monday that he was in favour of maintaining relations with Poland, but he repeated his earlier opinions. “Historical truth cannot be changed. Many Poles collaborated with the Nazis and took part in the destruction of the Jews during the Holocaust… Anti-Semitism was innate among the Poles before the Holocaust, during it and after it, too,” he said. Netanyahu’s office has insisted that the Israeli leader was “misquoted” and had not implicated all Poles in the Holocaust. Israel’s Ambassador to Poland Anna Azari was summoned by the Polish government, on Friday, and was asked to clarify Netanyahu’s comments. Morawiecki said, in an interview published by Polish news agency PAP, on Sunday, that Azari explained that Netanyahu was referring to individual cases of Poles collaborating with Nazis. Before World War II, Poland was home to one of the world’s biggest Jewish communities, which was almost wiped out by the Nazis. Many Poles still refuse to accept research showing that thousands of Poles participated in the Holocaust, in addition to the thousands who risked their lives to help the Jews. Tensions between Israel and Poland ran high, last year, after Poland introduced new legislation that would have made the use of phrases such as “Polish death camps” punishable by up to three years in prison. After pressure from the US government and an outcry in Israel, Poland watered down the legislation, removing the prison sentences.